The Days of Johann, an agility dog! : It's Arbor Day - time to plant and fertilize a tree! It's Arbor Day - time to plant and fertilize a tree! Today is a great day for us pups - it's Arbor Day! What's so great about it? Time to plant a tree, lift your leg and fertilize away! What is Arbor Day? Arbor Day is a nationally celebrated observance that encourages tree planting and care. Founded by J. 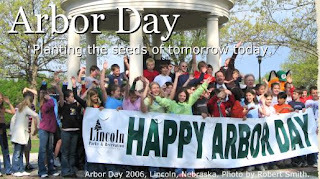 Sterling Morton in Nebraska in 1872, National Arbor Day is celebrated each year on the last Friday in April. Every state has it's own Arbor Day according to the best tree planting times. Today it's our day in Indiana. What are some cool things you can do for Arbor Day? Join the Arbor Day Foundation and get 10 free trees! Join Only Natural Pet Store in the Trees for the Future project and help plant thousands of trees in a number of villages across the world. Send a free e-card to your best bud! Learn more about trees, identify, and find out the best ones for your area and planting location! Get in the know on taking care of your trees! Pick up some free literature and spread the word. And, pups? Don't forget to fertilize! Mom and I get to plant trees tomorrow. She has to take care of them all summer so that means lots of hikes for me. She needs me to help her dig the holes and I'm happy to do it for her. I love digging.